Here you'll find some St. Patrick's Day recipes for March 17. So get out your green food coloring and green sprinkles and have some fun with the kids with these St. Patrick's Day food ideas. In the morning, add some green food coloring to your milk. Make green pancakes and green eggs. Sugar cookies are perfect for St. Patty's. You can add green food coloring to the dough mix or top them with green sprinkles (you can add a drop of green food coloring to some sugar for your own green topping). 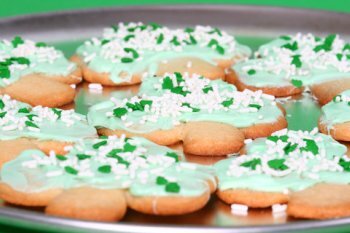 Green icing goes a long way on sugar cookies or cupcakes. Use green gum drops or green fruit roll-ups to cut out shamrock shapes to put on top of toast, pancakes, cookies or cupcakes. Another fun idea is to take sugar cookie dough and separate into 6 balls. Use food coloring to color each ball a different color of the rainbow (hint: mix red and yellow to make orange, yellow and blue to make green, red and blue to make purple). Roll balls with your hand to make 6 long pieces. Place on a greased cookie sheet, one long strip above the other and curve to make it shaped like a rainbow. Bake your rainbow cookies for 9-11 minutes. Serve on a platter with gold coin chocolates. To make a leprechaun hat, first take an Oreo cookie, then place a marshmallow on top in the center of the cookie. Next spread green icing all over the "hat". Cut a small piece of licorice and wind around the marshmallow to make a hat band. Then cut a yellow gum drop (or cut out a tiny square piece of yellow fruit roll-up). Use a little icing to hold the yellow "buckle" in place on the black licorice. And there you have a cute little green leprechaun hat for kids to enjoy. Scoop sherbet and ice cream into a large punch bowl. Pour carbonated lemon lime drink (the drink will get nice and fizzy/foamy). Add crushed ice and stir. Add fresh mint leaves and fresh lime slices to float on the top of the punch. This makes a nice green punch for a party. The English call Irish sausages "bangers". They are succulent pork sausages and are commonly served with mashed potatoes. Add some parsley for some green. Grill sausages. Serve on a plate with two scoops of mashed potatoes. Add a dab of butter and sprinkle some dried parsley on the potatoes. These are traditional Irish potato pancakes. A very simple recipe for kids. Mix ingredients together to make a pancake batter. Heat fry pan, then add 1-2 tablespoons oil. Spread oil around pan. Spoon batter into pan to make small potato pancakes about 4 inches in diameter. Cook on one side, then carefully flip to other side and cook until golden brown. Serve with a dollop of sour cream on top and some parsley for decoration. The Irish use baking soda to leaven bread. This is a quick bread recipe to go with your Irish stew or bangers. Preheat oven to 375F (190C) degrees. In a medium bowl, add flour, baking soda, baking powder and salt. Cut butter and add to dry mixture. Combine to form crumbs. Add egg and buttermilk and mix together by hand just enough until wet. Lightly dust counter with flour. Gently knead the dough for only about 1 minute. Then shape dough into a 6 inch round and place on a greased baking sheet. Make a cross with your hand across the loaf. Brush egg white over the loaf. This will make it come out a beautiful golden brown. Bake for 30-35 minutes. Cool on a rack. Fill a large pot with water. Add beef, onion, garlic, and bay leaf and bring to a boil. Reduce to low and simmer covered for 2 hours. Add seasoning, cabbage, and potatoes. Bring to a boil, reduce to simmer for 30 more minutes. Remove corned beef from pot and slice thinly. Serve cabbage and potatoes as a soup or remove from soup and serve as a side vegetable. Make pistachio pudding according to package instructions. Pour pudding mixture into glasses filling them about 2/3 full. Place in refrigerator until set. Pour chocolate syrup on top of the pudding. Add a dollop of Cool Whip on top. Cover with green sprinkles and chocolate shavings. Serve on St. Patrick's Day.